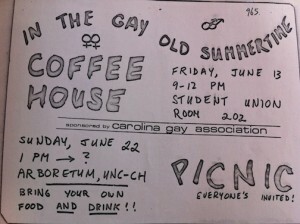 In honor of LGBTQ Pride Month and recent legislation in North Carolina, our fourth episode focuses on the history of LGBTQ life and activism in North Carolina. First, former SOHP field scholar Evan Faulkenbury and former SOHP intern Aaron Hayworth discuss their recently published article in the special edition of the Oral History Review. We also share excerpts from an interview with Professor Randall Kenan, whose oral history highlighted in Evan and Aaron’s paper illuminates the intersecting identities of race and sexual orientation. Next, field scholar Carol Prince talks about what she learned conducting oral histories with Erin Karcher and Genia Smith, two small business owners in Durham whose experiences of sexuality and gender complicate dominant understandings of entrepreneurship. Then, we share three clips from the SOHP archive that underscore the different contours of LGBTQ identity in the South. 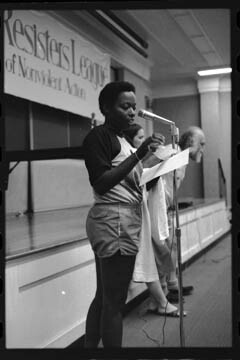 In an interview from 2007, Mandy Carter, a black lesbian social justice activist, discusses the motivations behind founding Southerners on New Ground. Then in an interview from 2014, Dr. Terri Phoenix, director of the LGBTQ Center at UNC Chapel Hill, discusses the ongoing fight for gender neutral bathrooms. And last, Ping Nguyen, a graduate of UNC, reflects on the differences (or lack thereof) between queer life in the North and the South. Finally, former SOHP intern (and new Press Record co-host) Charlotte Eure and field scholar Carol Prince discuss the tensions that surface while doing queer oral history for academic purposes. You can listen to Episode 4 below through SoundCloud, and please subscribe and rate us on iTunes! Check out the 2013-14 SOHP Intern Project on LGBTQ Activism, including the interview with Randall Kenan, here. 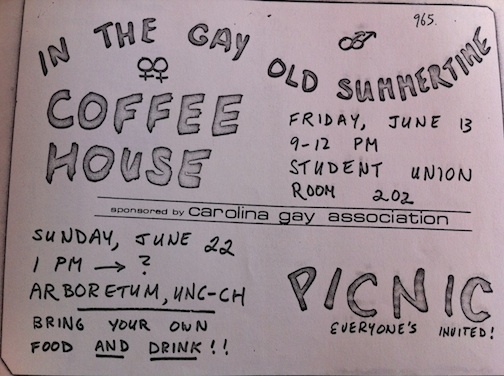 Evan Faulkenbury and Aaron Hayworth, “The Carolina Gay Association, Oral History, and Coming Out at the University of North Carolina,” Oral History Review 43, no. 1 (2016). Full interviews: Mandy Carter 1 and 2 | Terri Phoenix | Ping Nguyen. The oral history interviews with Erin Karcher and Genia Smith featured in this episode have not yet been processed. Please visit our interview database projects page here, search through our entire collection here for more materials on LGBTQ life in the South, or contact Carol Prince at cprince2@live.unc.edu. Special thanks to Julien Baker for this episode’s music.